This home office design is unquestionably full of fine taste — with ornate patterns, sharp and stylish decor, accents of nature, and an overall ethereal atmosphere. The wall bed unit was seamlessly integrated to reinforce the contemporary charm and also act as a resting place, literally and figuratively, from all the busy details of this room. As a budget-friendly solution to wanting a painted wood design, the wall bed is constructed in a white laminate with Unity wood drawer and cabinet faces. Elegant clear glass inserts are spread across the top of the unit providing a place to put linens and miscellaneous things, while also adding textural variance and a fragile and classy touch to the design. As this is a smaller room, this modern wall bed design saves a great deal of space and converts the space easily into a guest room. The modern and sleek design is a masterpiece both hidden away and folded down. The bed in the office wall unit folds down in traditional Murphy fashion, converting this small home office into comfortable sleeping quarters. 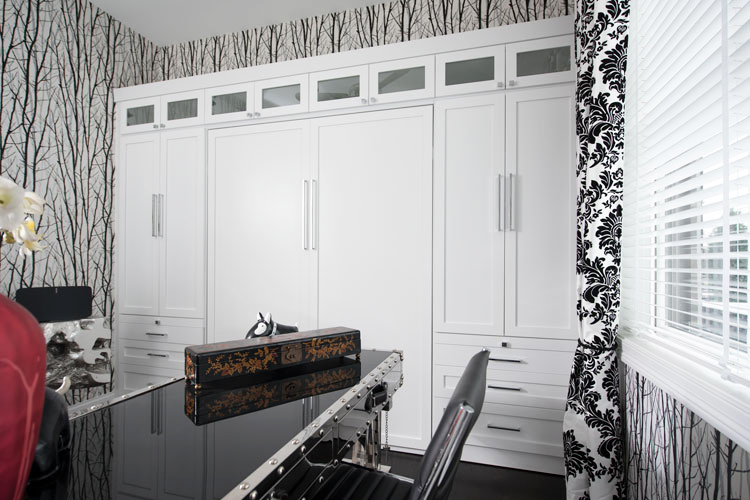 Like all Closet Works wall bed systems, the wall unit/cabinetry surrounding the bed provides ample storage. Pull-out shelves, cabinets and overhead compartments with glass inserts offer both convenience and organization for the owner of this dual purpose space. 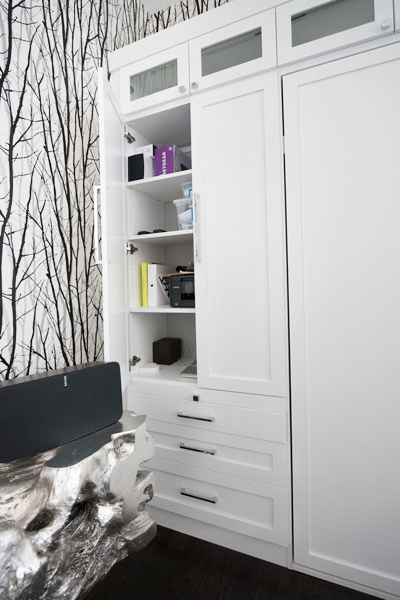 The built in bed provides wall storage in a small room used as a home office. The solid white hidden bed design acts as visual break from the busy patterns of the room. 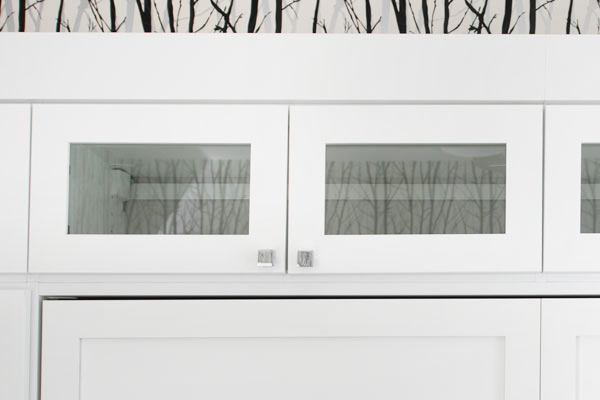 Cabinets provide wall storage for electronics, office supplies, and more. 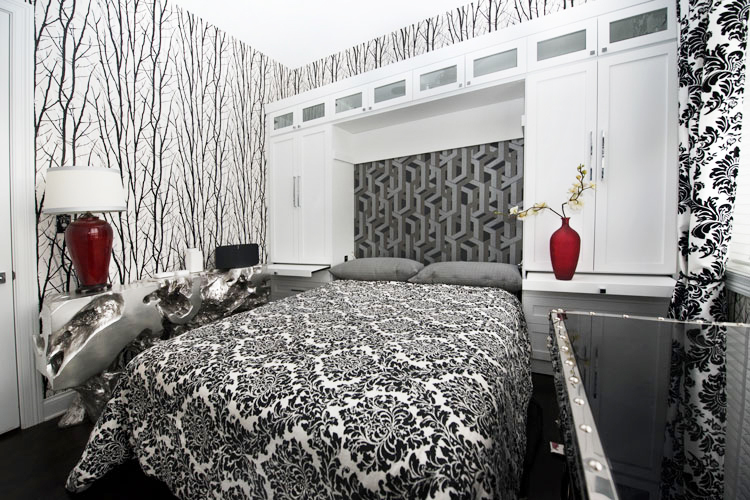 The modern bed design spans the wall and becomes a showcase in the artistic room. A queen bed folds down as a guest bed in this home office. Glass inserts are a delicate accent and are a welcoming textural, contrasting element. 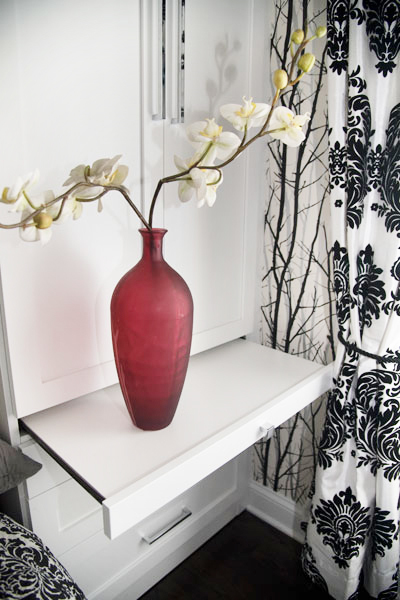 Pull out shelf is convenient for bedside belongings and decor.